The end of year May Ball is the highlight of the student social calendar and in Cambridge it has become quite a competitive affair, with each of the college’s battling it out to see who can hold the most talked about event in town. 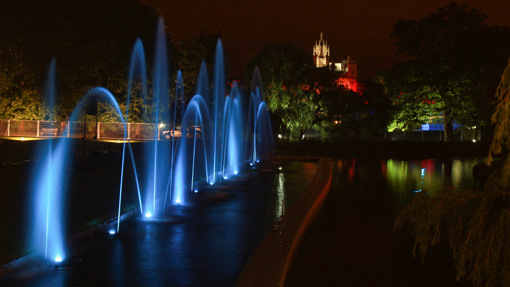 We have been involved in numerous events over the recent years visually enhancing the parties but on of the most memorable was at Trinity College Cambridge where we installed a large floating fountain system in the river. Trinity College is situated right on the bank of the river Cam and the City is synonymous with punting up and down the waterway so it made perfect sense to try and integrate the river in the party. There were two main challenges, the first was working on such a busy stretch of river, especially one frequented by tourists who are struggling with the skill of operating a punt. The second was finding a way of safely securing the fountain in the river so that it stayed in the correct position. The flow of the water as well as the pulsing off the pumps causes the fountain to constantly move. In order to avoid any of the other river uses crashing into our equipment and potentially damaging it or themselves we created a safety barrier. This was achieved by building a floating pontoon in the river positioned a few meters from the bank. This narrowed the river slightly but created a clear impenetrable safety barrier. The fountains were secured to the bank using metal stakes are were tied in position ensuring they didn’t float downstream. 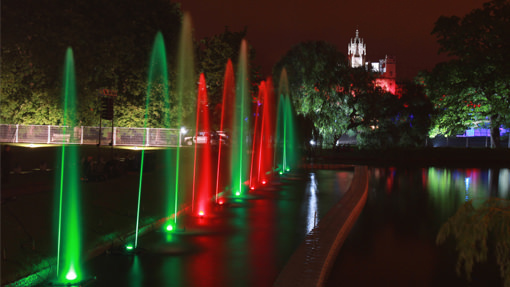 The fountains provided a stunning addition to the event, they were used in conjunction as part of the evening entertainment at the forefront of the firework display. They were then left to scroll through a range of colours and shapes for the remainder of the evening and provided a beautiful backdrop for many student photos. Most notably the ‘last man standing photo’ which is a tradition for all those students who party throughout the whole night until sunrise.